Following the violence in Charlottesville this week, many of us have been discussing with renewed commitment and urgency the Christian responsibility to speak truthfully about the oppression and degradation of marginalized people, especially people of color. In our Diocese, the Bishop empaneled a Commission on Racial Justice and Reconciliation nearly two years ago. That commission has been working in an ongoing way to provide resources and opportunities for all of our congregations to have frank and open dialogue about the ways in which racism (systemic and otherwise) impacts the lives of individuals and communities across Long Island. Long Island is home to the most diverse urban community on the planet (Queens) as well as some of the most segregated suburbs in the nation (Suffolk). The Cathedral finds itself in a privileged position at the heart of the Diocese. 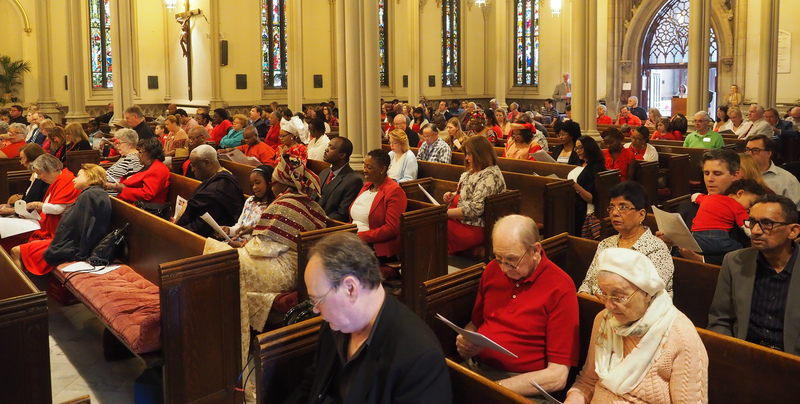 We are, today, one of the most racially diverse congregations in the Diocese. We have been, since 1885, a House of Prayer for Long Island. We take our diversity and our mission very seriously. Therefore, we ensure that the Cathedral is a place where God’s diverse human family on this island feels welcomed and honored at all times. This is God’s house; where racism, bigotry and white supremacy will never find a home. It is the responsibility of the preachers in this place to engage the rich scriptural tradition at the core of our religion and make connections to the events and concerns of the day, including the sins of racism and white supremacy. It is the responsibility of the whole community to be open to the inspiration of the Holy Spirit in word and sacrament, moving us to become effective ministers of God’s justice, peace and love for all. I invite you, especially at this time of tension and fear in our country; to come to the Cathedral with open hearts, open minds and open hands. Come often. Receive what God has to offer you. Often, the gifts God gives us in worship are as challenging as they are comforting. That’s how we grow. Dialogue across difference in a community of care is one of the ways the Church heals the world in Christ’s name. That work always begin with you and me, here and now. This is one immediate example of how our theology and our care for our neighbors takes shape in word and deed. We are invited to explore together how we, as the Cathedral community, will make real our commitment to respect the dignity of every human by combatting racism and white supremacy on Long Island. I am grateful to God that we worship and serve in a community of faith that carefully considers our Christian responsibility to engage the significant challenges of our time thoughtfully, with dignity and respect. It is truly a gift. The Cathedral is a place where mutual care for one another in non-negotiable and where we seek, day by day, to grow into the full stature of God in Christ. God is giving us difficult work to do as healers and reconcilers. I know we are up to the task. May God continually give us the courage to step toward one another in faith rather than away from one another in fear.